WASHINGTON (CNN) -- The son of the former shah of Iran called Monday for solidarity against Iran's Islamic regime, warning that the democratic movement born out of the election crisis might not succeed without international support. Reza Shah Pahlavi has lived in exile since 1979, when his father was overthrown during the Islamic Revolution. 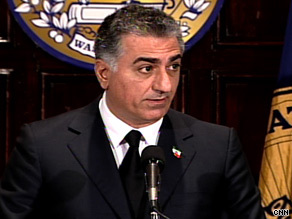 "The moment of truth has arrived," Reza Shah Pahlavi said at Washington's National Press Club. "The people of Iran need to know who stands with them." Pahlavi has lived in exile since 1979, when his father, Mohammad Reza Shah Pahlavi, was overthrown during the Islamic Revolution. Under the shah's regime, Iran saw nationalization of its oil and a strong movement toward modernization. Still, his secular programs and recognition of Israel cost him the support of the country's Shiite clergy, sparking clashes with the religious right and others who resented his pro-West views. The son now lives in the United States with his family, where he spends much of his time talking about the Islamic regime in Iran. Citing anecdotes from people inside the Iranian establishment, Pahlavi said he had heard that security forces have begun to distance themselves from the regime. "It has already started," he said, citing reports that members of the security forces have gone home after their shifts ended and changed into plain clothes to join the protesters. "Many, many elements within the security forces, within the Revolutionary Guard, are showing discontent," Pahlavi said. "There is an amazing reflection that is happening. ... This is a movement that has blown out of proportion." Pahlavi praised the statements and tone of President Obama, saying that any outside attempt to interfere in Iran's internal affairs "will give the tyrants the excuse they need to paper over their own differences and target every man struggling for freedom as a foreign agent." But he said there was a difference between interfering in a country's sovereign affairs and standing for principles of human rights and democracy. "We welcome that. This is effective. It is important," he said. "This is precisely what Iranians at home demand world leaders, particularly someone like President Obama, who after all his entire message of hope and change and affirmative action ... was a big inspiration to many." But, he added, Obama and other world leaders must be prepared to change their tactics if the violence against protesters gets much worse. "The question is, what will the world governments do this time?" he asked. "Are we going to have Tiananmen Square revisited? Or is [it] going to be this time different?"